On the outside, it may look like an ordinary industrial shipping container, but on the inside it’s nothing short of extraordinary. Step into the temperature-controlled environment — a virtual oasis of calm bathed in purple lights that emanate from dozens of overhead, state-of-the art LED lights — and breathe in the rich aroma of soil and take in the rows upon rows of grow trays teeming with verdant green plants and herbs. Welcome to the Grow Pod Lab. First-year students in Bean Hall’s Community for Environmental Leaders academic residential community — many of whom have never grown plants from seeds before — have spent the last few months getting their hands dirty and raising their first crops of indoor tomatoes. Designed to promote ongoing research, learning and innovation for sustainable urban food production, the idea for bringing indoor agriculture to the UO campus came with the generous donation of a shipping container by Imagination International Inc. Additional help came from a $10,000 applied environmental science seed grant awarded to the food studies program and the UO Office of Sustainability to support the start-up. 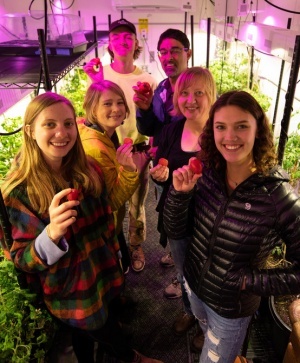 As the first group of academic residential community students to tend to and nurture a crop of tomatoes in the Grow Pod, emulating inside a 20-foot-long metal box what naturally occurs outside comes with its own set of challenges. That includes everything from determining the correct amount and strength of light the plants get, how much water they get and the precise consistency of soil and nutrients to figuring out how the plants can pollinate if there is no wind or bees to carry the pollen from plant to plant. When a student posed the pollination question, it led to an ingenious solution: electric toothbrushes. Applied gently to the plant’s blooms, the vibration releases the pollen into the enclosed environment allowing pollination to occur. Meier said the learn-as-you go approach has evolved since they started last fall, and recently they brought in a master gardener to help. “It’s been a collective effort to figure out things as we go along, but the students are doing a pretty good job of taking ownership over it,” she said. Courtney Kaltenbach, a music major, and Sydney Gastman, who is majoring in landscape architecture, got involved in the Grow Pod project through the Environmental Leaders academic community and agree the experience has been amazing. “The greatest satisfaction was seeing something grow and being a part of that and working with a team of people with the same goals,” Kaltenbach said. Look for students from the program selling a variety of plant starts at a table outside the Erb Memorial Union during Earth week, April 22-24. The Office of Sustainability is also exploring a number of additional academic and co-curricular opportunities. They include computer science classes using data generated from the lab to study machine learning, and UO business classes identifying income-generating opportunities for crops raised in the pod. The indoor, controlled-environment agriculture industry has grown dramatically in the past several years. Shipping containers outfitted for growing vegetables are being used by farm-to-table restaurants, to support experiential education programs and for niche social enterprises that increase local food production in areas where land-based farming is limited. Mital said shipping containers might support urban homesteading or post-disaster recovery efforts in the future. “We’re hoping our faculty and local entrepreneurs help us explore the possibilities,” he said. On April 19, Meier and Mital will present “The Grow Pod Lab: A UO Indoor Agriculture Experiment” at the food studies Food Talks series. UO and community members are invited to tour the pod and learn more about potential research, curriculum and community engagement opportunities associated with the Grow Pod.